Thank you for your continued support of this site. We went by the house today. More demolition. The roof is off and the house is gutted. Old stucco is been ripped away like an orange peel. 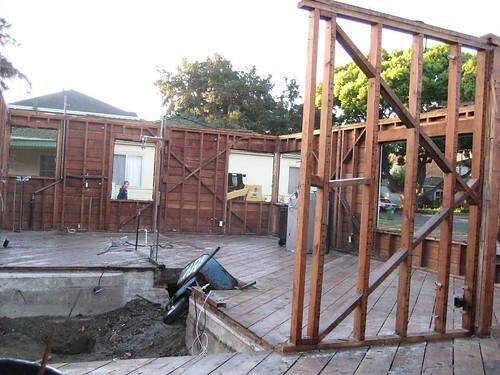 The frames are laid for the foundation. An inspector needs to come over and give the thumbs up to the rebar. We got a lot of rain last night, so the yard was especially muddy. Now that the frames are in, I’m finding that I can start to see it. It will be interesting when the right hand side of the house comes down.